Since the 1950s, Latina activist Dolores Huerta has been a fervent leader and organizer in the struggle for farmworkers' rights within the Latina/o community. A cofounder of the United Farm Workers union in the 1960s alongside César Chávez, Huerta was a union vice president for nearly four decades before starting her own foundation in the early 2000s. She continues to act as a dynamic speaker, passionate lobbyist, and dedicated figure for social and political change, but her crucial contributions and commanding presence have often been overshadowed by those of Chávez and other leaders in the Chicana/o movement. In this new study, Stacey K. Sowards closely examines Huerta's rhetorical skills both in and out of the public eye and defines Huerta's vital place within Chicana/o history. 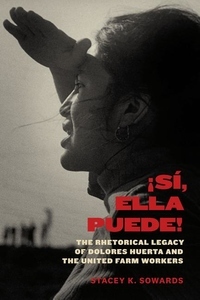 Referencing the theoretical works of Pierre Bourdieu, Chela Sandoval, Gloria Anzaldúa, and others, Sowards closely analyzes Huerta's speeches, letters, and interviews. She shows how Huerta navigates the complex intersections of race, ethnicity, gender, language, and class through the myriad challenges faced by women activists of color. Sowards's approach to studying Huerta's rhetorical influence offers a unique perspective for understanding the transformative relationship between agency and social justice.